By the late eighteen hundreds, U.S. public lands were in a crisis. Unregulated use had resulted in widespread damage to forest, water resources and agricultural lands. A few enlightened men initiated cries against what had become rampant exploitation and destruction of the country's resources. Struggling into the light of public attention, the issues and complexities were finally recognized by the government who created entities to address them. Among these were the departments that led to the formation of the United States Forest Service. This newly formed service called for men of courage and ability, men with a vast array of skills and an iron self-reliance who could nurture and manage an endangered land. Such a man who answered the call to action was James Grimshaw Cayton. Birdie Miller, was born Adelaide Dorothea Miller in Central City, Colorado in 1887. 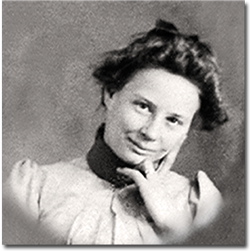 At the age of five, she (the eldest of nine children) along with her family took up residence in Grass Valley, CO to manage her uncle’s ranch. As a young girl, tasked with tending to her uncle’s 10,000 head of cattle, Birdie cultivated a love - and a deftness - for hard work and the outdoors. It was a work ethic that would prove useful in her later years working by Jim’s side – and sometimes in his stead - for the Forest Service. 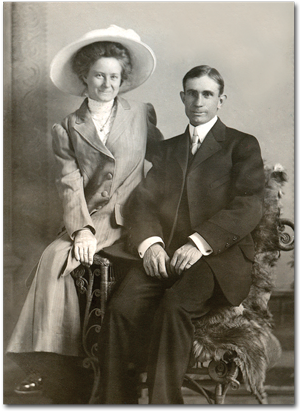 Jim met Birdie in early 1909 at a dance at the Fairview School where Birdie was a teacher at nearby Mamm Creek School. A short seven months later they were married, and days after that - barely ahead of the formidable Colorado winter - they began building their new guard station/home, currently known as Cayton Ranger Station. 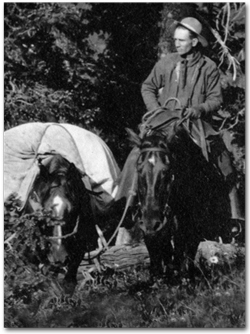 They were beloved members of the communities in which they lived and valued by the Forest Service in which they both served for 35 years. Excerpted with permission from James G. Cayton Pioneer Forest Ranger.